Wall filing system mounts easily and securely to any flat vertical surface. Expansion of this modular file is as simple as attaching the desired number of add-on pockets to each basic pocket. 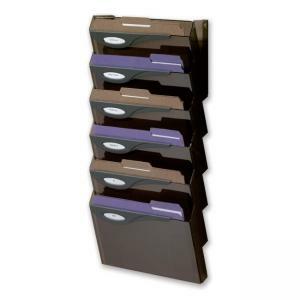 Filing system includes all necessary hardware and mounting materials. Space required is 13" wide x 29-1/4" high. Filing system contains one basic pocket and six add-on pockets so it makes seven compartments. Included Deluxe Hot File Labeling System offers one easy-to-apply label holder packet for each pocket. Each pocket accommodates material up to 12-1/2" wide.